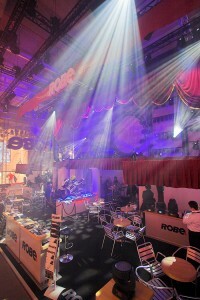 Robe concluded its "busiest and best" Prolight+Sound exhibition to date at the Frankfurt Messe. 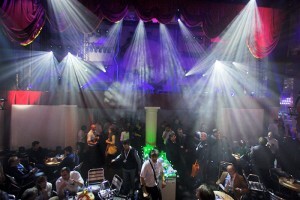 The action-packed four-day Robe schedule included the launch of six innovative new fixtures, a press event announcing the company’s sponsorship of Czech MotoGP racing star Karel Abraham and a show-stopping lightshow on the booth that had people packing the aisles each day waiting in anticipation … and receiving it with rounds of rapturous applause. Said Robe’s CEO Josef Valchar: "We said that last year’s Frankfurt was the best ever trade show … but this year’s has surpassed, both in terms of the business completed, the interest in the new products and the general vibe – it has been incredible!" The much-anticipated Pointe moving light was the focus of Robe’s new technology launches this year – a small, very bright, multi-functional fixture which can be used as a beam, spot, wash or effects unit - with static and rotating gobo wheels, two prisms, variable zoom when in Beam and Spot modes plus a host of other features. By the end of the exhibition so many orders had been confirmed for Pointes – that production will be kept busy for the next six months. To deal with this plans are being put in place to boost production capacity at the factory in Valasske Mezirici to meet customer demand. This is absolutely unprecedented in Robe’s history of trade shows … to come back from an exhibition with this many confirmed orders. In addition to the Pointe, Robe’s other new products are the ROBIN MiniMe - an effects lighting luminaire with the addition of full video output; the ROBIN CycFX - a one metre linear LED strip that can be tilted 270 degrees with an 8 to 53 degree zoom option; the ROBIN Cyclone a moving head with integrated fan surrounded by a ring of 24 RGBW multichip LEDs and the ROBIN MMX Blade a 1200-series equivalent lightsource complete with a framing shutter system. Also new is the latest in Robe’s DigitalSpot series – the DigitalSpot 7100DT. Continuing it’s ‘Working With Winners’ theme, Robe is sponsoring the young and highly talented Czech MotoGP rider Karel Abraham throughout the 2013 international race season. Karel’s Cardion AB Motoracing team pitched their hospitality pavilion right outside Hall 11 for the duration of the exhibition providing an extra meeting and chill-out area for Robe. Karel came to Frankfurt on the Thursday morning for the press event announcing the sponsorship, after which he signed posters, autographs and posed for a string of photos on the stand. His Aprilia ART bike – with top speeds of over 330 km/h - was also on show providing an additional point of interest on the stand, underlit by Anolis ArcDots and MC1s. Robe’s Nathan Wan - who also designed the theatre-look stand which took on a completely different style to anything seen before on a Robe booth - designed this year’s amazing full-on lightshow. Word about the show spread like wildfire and soon the aisle in front of the booth was thronging with people every half hour waiting for the 3.5 minute show which featured all the new products plus some other Robe favourites. It was set to a special soundtrack and helped keep the stand busy for the entirety of the exhibition. A large printed theatre drape covered the top ‘upstage’ section of the stand. Seconds before each showtime, this was lowered on Kinesys hoists to reveal a true rock ‘n’ roll style ‘wall of death’ in lights behind. If Metallica had walked out onto the platform in front, no-one would have been surprised! Lightshow statistics include over 220 cues and 8192 channels of DMX across 16 universes … and it was a major talking point of the whole exhibition. Look out for this style of presentation on future Robe exhibition stands. Before arriving at Frankfurt, Nathan visualised the show using ESP’s latest Vision software which saved loads of time and enabled him to arrive in Frankfurt with a large part of the show already pre-programmed on his Avolites Sapphire Touch console. The day before Prolight+Sound opened, Robe held its 5th biennial International Distributor Conference and Awards event, which was attended by over 170 members of the Robe Family from all corners of the globe. The new products were all revealed and demonstrated in depth during the conference section of this, and everyone’s hard work and commitment to the brand was celebrated with the presentation of over 30 Awards. This was a massive energiser for everyone involved in Robe just before the show. 2012 was the most successful yet in the company’s short history … and 2013 looks set to surpass that! In picture: Robe CEO Josef Valchar with MotoGP racer Karel Abraham.